Karmapa Ogyen Trinley Dorje — the second most important Tibetan monk after the Dalai Lama — who left India for the US in May last year may never come back, apprehend sources in the Himachal police and local intelligence agencies. Sources told The Tribune that the Karmapa may extend his stay “indefinitely or even seek asylum in the US”. He was under regular surveillance at the Gyuto Tantric Monastery here, “but in the US, he will be free to travel and to meet anybody, even those coming from China”, sources said. In Delhi, Home Ministry sources cited ‘medical reasons’ for him being there. A senior official at the Karmapa’s office refused to comment on the matter. Despite several attempts, officials of the Tibetan government in exile were unavailable for a response. This is the longest — almost 14 months — that a Tibetan monk of this rank has been away from India. The Dalai Lama’s trips abroad usually last for a couple of months. As requested by the Central Tibetan Administration, a three-month visa is issued to Tibetan IC (Identity Certificate) holders for travel abroad. 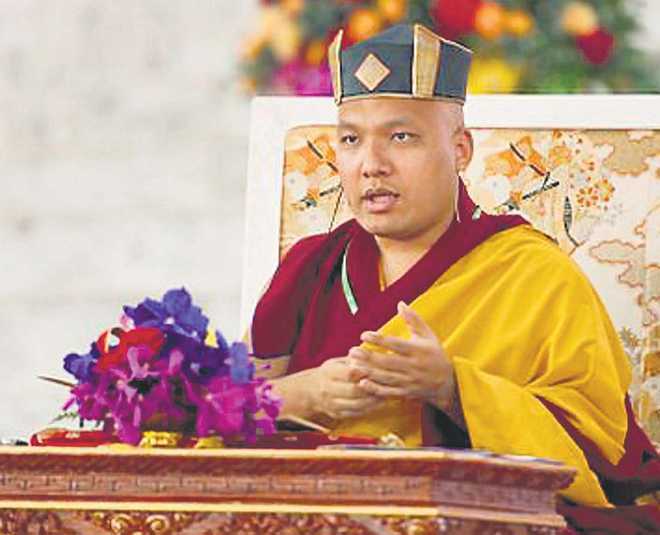 Sources at the Gyuto Tantric Monastery, where the Karmapa had been staying after his exile in 2001, said he has international engagements in 2018 and is unlikely to return this year. This has got local Tibetans worried. Tenzen Tsundue, a prominent Tibet activist, said the Karmapa was needed more in India than in the US. Dorje was born on June 26, 1985, in a nomad community of Bakor in eastern Tibet. He was recognised as a reincarnation of the 16th Karmapa by the Dalai Lama in June 1992. A prominent teacher, Shamar Rinpoche, refused to recognise Dorje as 17th Karmapa, claiming Thaye Trinley Dorje was the real one. The latter, however, married in 2017 and renounced monkhood, ending the festering row. The present Karmapa had escaped the Tsurphu monastery in Tibet on December 28,1999, and arrived at Dharamsala on January 5, 2000, trekking about 1,100 km while dodging the Chinese army. Later, Tai Situ Rinpoche, who reportedly managed the Karmapa’s escape, wanted to take him to Rumtek monastery in Sikkim, the traditional seat of the Black Hat sect to which Dorje belongs. But the Indian Government did not allow it. At Dharamsala, Dorje stayed in Gyuto Tantric Monastery under strict vigil. He was not allowed to travel for many years and it was only last year that he was could move out of India and also visit Sikkim, but not Rumtek. An unsavoury controversy erupted in January 2011 when the Una police in Himachal Pradesh caught the driver of a Dharamsala-based businessman with Rs 1 crore in cash which was reportedly exchanged in a land deal between Karma Garchen Trust headed by Dorje and the businessman. In subsequent raids, the police recovered Rs 6 crore in 26 currencies and Rs 53 lakh in Indian currency from Gyuto Tantric Monastery. The trust did not have permission to receive foreign funds. About the Karmapa's trip to the US, sources said he has a well-established network of followers in New York who have set up an infrastructure for him. Interestingly, the Karmapa’s teachers, including Tai Situ Rinpoche, have also been out of India for the past many months. There were reports that Dorje wanted to visit China to meet his parents. But in a statement issued by him recently, the he declared he would return to Tibet only with the Dalai Lama. A prominent teacher, Shamar Rinpoche, refused to recognise Dorje as 17th Karmapa, claiming Thaye Trinley Dorje was the real one. The latter married in 2017 & renounced monkhood, ending the row.